Ozzie Pest Control should your first call for building and pest inspections when buying your next home or investment property. Why? Because you want inspectors that work for you and you only. You want inspectors that tell you all the facts about the building and present them to you in a high quality report with meaningful recommendations and findings. We inspect all areas of the property, photograph any areas of concern and explain the reason or problems and any corrective action required in the report. 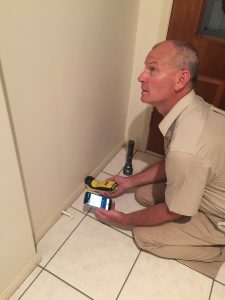 Darren Smith has over 18 years of termite inspection and pre-purchase inspection experience in all South East Queensland areas and combined with his knowledge of building construction and timber pests, you can be assured that you will receive the highest possible level of inspection and service when you need it the most. Don’t just use the first company that you find on google or the inspection company recommended by your agent, because there is a chance they may not have your best interest at heart. Feel free to contact Ozzie Pest Control and have a chat to Darren about your inspection requirements. We also work in conjunction with Ipswich & West Moreton Building Services which carry out the Building Inspection aspect of your pre-purchase inspections. That means you have two of the highest level of inspectors working for you on your inspection reports. Not one person who inspects for both building and pests and is not an expert on one or the other. Use the inspectors the real estate agents use when they buy a property.